A creamy blend of cheeses and MIRACLE WHIP makes a delicious topping for sliced zucchini in this bruschetta-inspired appetizer. Combine all ingredients except zucchini until blended. 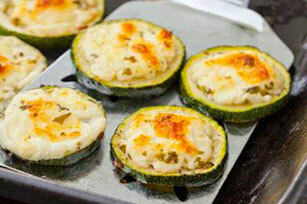 Top zucchini slices evenly with cheese mixture. Place on baking sheet. Broil, 4 to 6 inches from heat, 3 to 4 min. or until cheese is melted. Add 1/4 cup Oscar Mayer Real Bacon Bits to cheese mixture. Continue as directed.